IK Multimedia has announced the latest interface in its best-selling iRig line: the iRig HD 2. Chief among the new device's features are a headphone output with level control and 1/4" output jack for connecting to a guitar amp or PA system. Also new is a thru/FX switch (for bypassing or engaging processing to the 1/4" out), as well as a mic stand clip and Velcro strip - handy for live performances - while a 1/4" input with "precision" gain control also features. 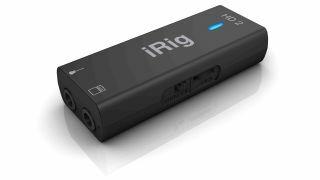 Although last year's affordable iRig 2 added several of these new features, the iRig HD 2 offers a 24-bit/96kHz noiseless digital interface that connects to iOS or Mac/PC via Lightning connector or USB - and yes, that means it will work with the iPhone 7. Best of all, it comes with a free download of the full version of AmpliTube 4 for both iOS and Mac/PC. Tidy. iRig HD 2 is available at the end of September for €99.99/$99.99, and is up for pre-order now at IK Multimedia.